Typhoon Rusa -- the most powerful one to hit South Korea in 40 years -- left more than 150 dead or missing and flooded over 40,000 hectares of farmland. While soldiers and anti-disaster officials were busy in relief efforts, the government's National Disaster Prevention and Countermeasures headquarters was trying to confirm reports that more people were swept away by floodwaters or buried in landslides caused by Rusa. Rusa has dumped about 91 centimetre of rain in eastern and southern South Korea. Wind gusts of up to 127 miles per hour have uprooted trees and knocked down 7,800 electricity poles. The resulting blackout has plunged 1.16 million households into darkness. Telephone services have also been disrupted badly. More than 17,000 houses and buildings are submerged in low-lying areas, forcing around 30,000 residents to take shelter in public buildings and schools. 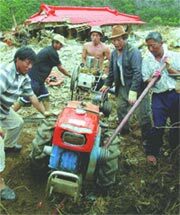 The worst affected are the provinces of Kangwon and Tongchon. The magnitude of the destruction has prompted the South Korean government to consider creating a supplementary budget for victims of the typhoon. The estimated cost of the damage to date was us $262 million with reports of devastation continuing to pour in from across the country.